The author visiting for the holidays after being away for three years. There some things you can’t just find anywhere. For example, it’s tough to beat a hot fresh pizza slice from Prince Street Pizza in New York City, a freshly baked bagel loaded with cream cheese from Bagels Abroad in Clifton, New Jersey, and a fresh ripe yellow mango shake from the Philippines. However, this does not apply to everything. If you’re visiting Bonifacio Global City in the Philippines, you can find famous New York City icons like Shake Shack, Magnolia Bakery, and Wolfgang Puck within a block from each other. These three establishments just got built within the last year. Similarly, there are famous icons from the Philippines you can find in NYC. It has been three years since I moved to the Philippines from America; I was born and raised in New York City/New Jersey. 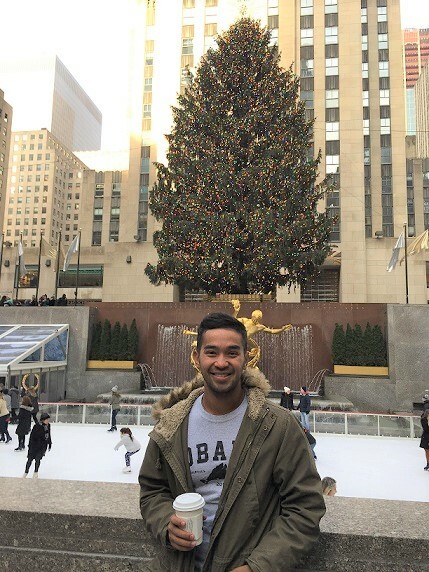 I recently took a three-week vacation back to New York City and New Jersey for the holidays to spend time with family and friends. I was also able to get a glimpse of all the recent inspirational activity I see on Facebook and Instagram of proud Filipinos and Filipino Americans posting about news related to the Philippines. All I did was take a stroll from Downtown to Uptown. Missing Mama Fina’s sizzling Sisig. At Jollibee, where there’s always a line to get in. Other than constantly getting coffee and milk tea with oat milk around the city (Boba Guys in Chinatown, FEED coffee in Brooklyn, Birch in the Lower East Side), I was able to experience another culinary delight at Mama Fina’s. Mama Fina’s has been my favorite spot for sizzling Sisig and garlic fried rice for the past several years. They started in New Jersey and now opened their first shop on Avenue A in the restaurants-packed East Village. 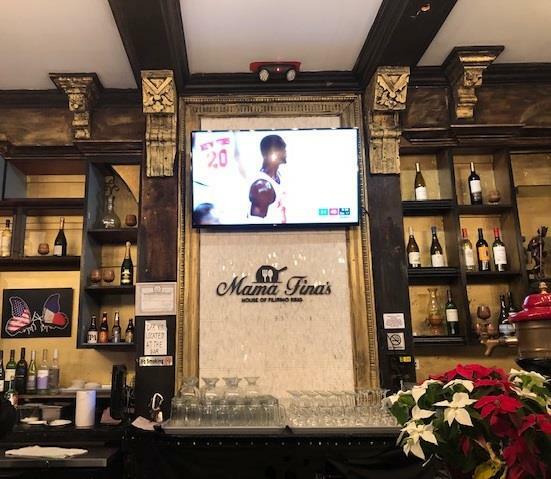 Although you can find articles written about them in The New York Times and other newspapers, you can already hear reviews from other customers rushing inside the restaurant for their variety of Sisig options. I was able to witness a couple inquiring about catering options before placing their orders. One day I decided to commute using NJ Transit as I did when I worked in the city. 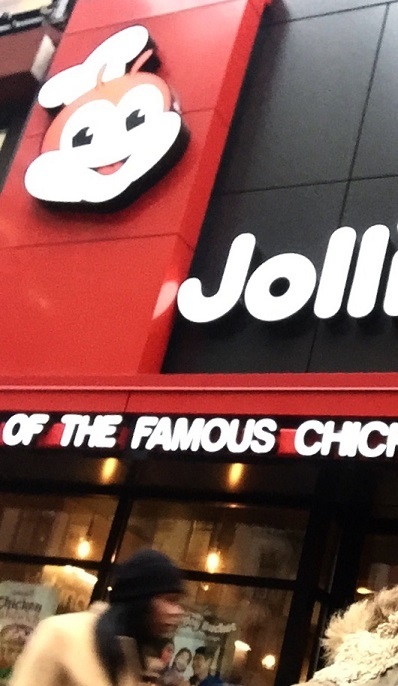 When I walked out of Port Authority Times Square and just a block away, I saw the internationally recognized bee symbol of the Philippine fast-food chain, Jollibee. Just like in their locations in the Philippines, there was a line of people waiting to place their orders of Chicken Joys and Mango pies. When I visited Uptown, I was able to see a familiar face representing the Philippines. 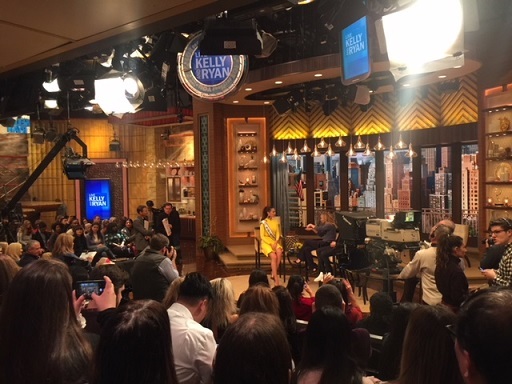 Miss Universe Catriona Gray was a guest on the “Live with Kelly and Ryan” morning show. I was lucky enough to get tickets and join other Filipinos rooting her on. A few days later, I saw her again in the “BUILD” live interview series where she took time to take pictures and talk with her fans. It is inspiring to see what has recently been going on with FilAms in the New York City area. Some notable mentions include: Michelle Obama’s book praising her daughters’ Filipina caretaker in her new book, Joshua Dela Cruz being the host of “Blue’s Clues,” and Kelsey Merritt being a Victoria Secret model. What’s next? How do we continue to build on this great momentum? A simple way is to stroll around neighborhoods like New York City and BGC, and get inspired by the positive energy these cities radiate. As a result, we can continue to learn and create possibilities that inspire.